Militaries toddlers embarrass Japan Prime Minister. Every morning the children of Tsukamoto kindergarten stomp their tiny feet in time to military anthems, bow to pictures of the emperor and vow courageously to offer themselves to defend the state. 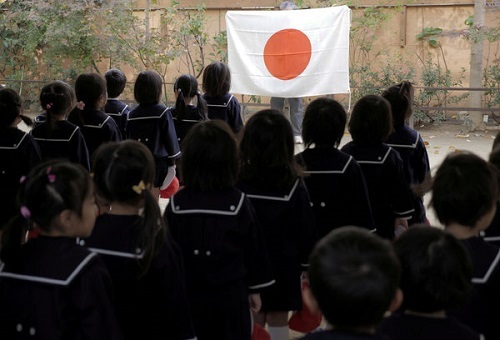 At school functions, the three-, four- and five-year-olds exhort watching parents to protect Japan from foreign threats. The great-grandparents of Tsukamoto's pupils were once taught similar fare, but state schools toned down the nationalism in the aftermath of the second world war. Until recently few Japanese realised that any private schools were still peddling such jingoism. They were even more surprised to learn that the government seems to have been encouraging them. Last year MoritomoGakuen, the firm that runs the kindergarten, bought a plot of public land in the city of Osaka at a knock-down price—perhaps 14% of its value. It began building a primary school to propagate the same ultranationalist ideas. It invoked the name of Shinzo Abe, the prime minister, when soliciting donations. His wife, Akie, gave a speech at the kindergarten and was named honorary head teacher. Tomomi Inada, the defence minister, sent a letter thanking the kindergarten for raising the morale of Japan's soldiers, after it had dispatched pupils to the docks to welcome returning warships. 例句:The Prime Minister reviewed the situation with his Cabinet yesterday. 例句:He used to be a teacher of maths in that primary school. 例句:She couldn't sell them even at the knock-down price. 例句:Graduates find ready employment where water is scarce and public land usage is high.